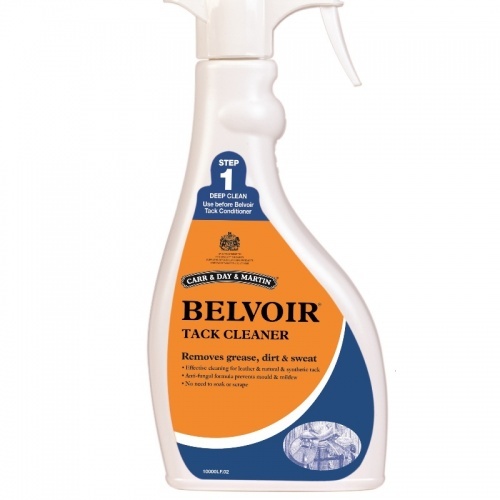 Belvoir Step 1 tack cleaner from Carr Day Martin removes all grease, sweat, dirt, dust, mould and mildew. Use as the first step in tack care to leave the perfect surface for the application of a conditioning soap. The pH neutral formula will not rot stitching or over dry the leather. Spray directly onto tack and wipe clean. For heavily soiled areas leave for 5 minutes before wiping. For best results once grease is removed apply Belvoir Tack conditioner as 'step 2' of the tack care process. Flamable product keep away from children and refrain from smoking whilst using this product.